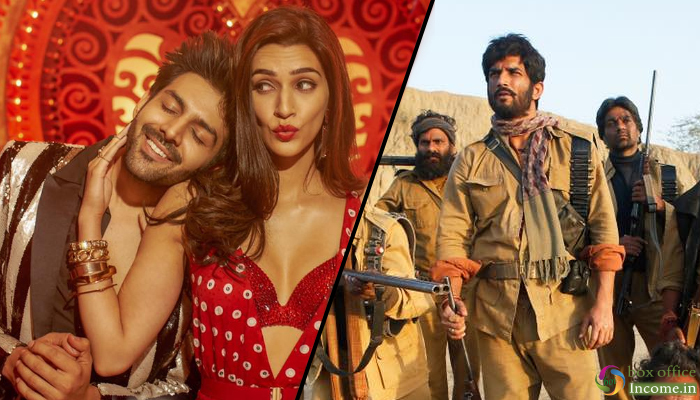 Box-office clashes are a delight for any trade pundit and this Friday, the cinema halls saw two different genres hit the screens – Luka Chuppi and Son Chiriya. And in just two days, the verdict is out that who has won this race. It’s Kartik Aaryan’s latest new-age romcom that has crashed Son Chiriya. While Luka Chuppi has proved to be a family entertainer, Son Chiriya has a niche audience to please and that makes the latter struggle at the ticket-window. Kartik Aaryan’s film Luka Chuppi has proved to be a complete entertainer. Critics have given it a thumbs-up and viewers are rushing to watch this unique take on live-in relationships. Kartik Aaryan’s film opened to great numbers and raked in Rs 8.01 crores on day one. With strong word of mouth, the film has jumped on day 2 and earned Rs. 10.08 crores which makes the total to Rs 18.09 crores. This is surely great news and a huge success for Kartik Aaryan. His film’s numbers has beaten Son Chiriya’s box-office numbers with a huge margin. With chartbuster numbers, entertaining script and great performances by actors and especially Kartik Aaryan, the film is going strong and is being loved by the audiences. After Sonu Ke Titu Ki Sweety, Kartik delivers yet another hit with Luka Chuppi. The actor is mass’ favourite and looks like his fans want more of him. Way to go, the latest box-office prince.